A structure fire in New Haven took approximately two hours to extinguish with no reported injuries of the firefighters on scene. NEW HAVEN — Local units respond to aid New Haven Volunteer Fire Department during structure fire on Monday. 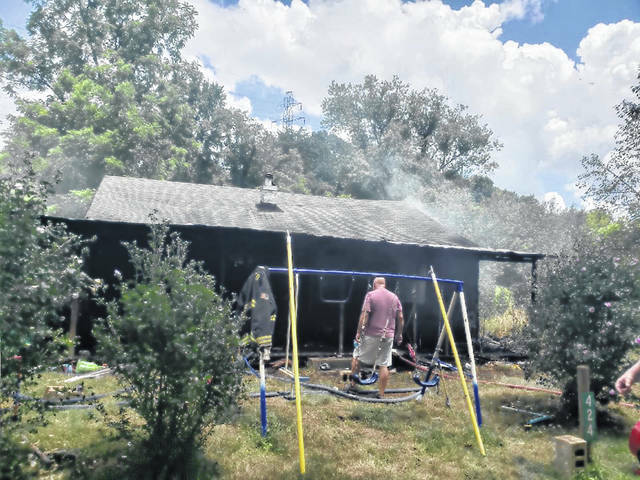 According to Mason County Volunteer Fire Department’s Facebook page, units were dispatched to Dewhurst Road to aid New Haven Volunteer Fire Department for a structure fire on Monday afternoon. Mason County Volunteer Fire Departments Engine-51 and Engine-53, with eight members, responded to the call. Units on scene worked to assist with fire and water supply. Additional help was requested from Point Pleasant Fire Department, Pomeroy Volunteer Fire Department, and Middleport Volunteer Fire Department. Units on scene worked approximately for two hours, with no injuries to the firefighters. The report stated the scene was a strong workload due to heavy fire conditions. A transitional attack was used from the yard to knock down the bulk of the fire and then was finished from the inside. Approximately 6,000 gallons of water were used. Also on scene were Mason County EMS and the Mason County Sheriff’s Office. Mason Ladies Auxiliary provided cold drinks. https://www.mydailysentinel.com/wp-content/uploads/sites/14/2018/07/web1_0724.Fire2_.jpgA structure fire in New Haven took approximately two hours to extinguish with no reported injuries of the firefighters on scene.